Thanks for letting us know, Trotter! I'll try to order a copy. Please forgive me if this isn't the done thing here. 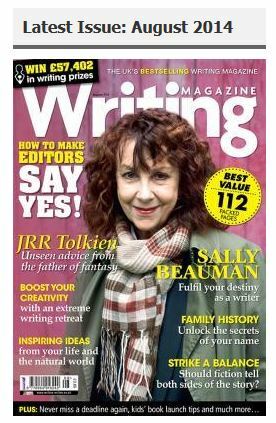 The mag can be purchased direct from us here: https://www.writers-online.co.uk/Store ... ters_Joint_-_August_2014/ and we do dispatch internationally. Thank you for highlighting us like this Trotter. I really enjoyed this article myself. Wish we could have had a lot more! Please forgive me if this isn't the done thing here. You are very welcome, "Wish we could have had a lot more!" please find some more? Thanks Trotter for the heads up. I'll be ordering a copy. Awesome find! The letter of 6 January 1969 was evidently the third of the three letters from Tolkien to Paula Iley sold at Christie's London on 23 November 1998 (http://www.christies.com/lotfinder/lo ... .aspx?intobjectid=1369237). The auction listing identified only two of them, but quoted part of the text of the 1969 letter page we can now read, and had a different illustration of overlapping letters. We'll try to order a copy of the magazine too, though we see that the online order form isn't set up to handle U.S. postal address formats straightforwardly. Thanks for the heads-up. Getting a copy, too!